52nd theme of Theme Challenge is Keeping a Secret. Originally, according to the earlier chapters of the Three Guardians, Akosmia and Energeia are supposed to keep themselves a secret so not to risk any problems with anyone else as well as letting Energeia be tainted. Well, when the last chapter, Three Guardians: Just a Photon Away, is finished, they already picked up some friends much to Pragma's dismay. That awkward moment when your team was supposed to consist of "The Power Trio" and suddenly becomes "a giant gang with people that somehow won't leave". Yep! Quite a change, huh? Energeia is just a natural friend maker. Aksomia: "Only with right kinds of people...."
AKosmia: "Me. I'm still lonely with no one to play with." \boops Ako's forehead. "A lot ofpeople love you. Just, a lot with clothes on." Akosmia: "But I'm prettier without clothing..."
on a plus, there making friends. not always good when your a guardian but good sense human... i think? they are human. with a bunch of galactic races it's hard to tell sometimes. so what ya doing for now? The usual daily geology chores and webcomic drawing. Really? Can you show me? Akosmia looks like that over 10 years since I posted "Three Guardians: The Mother of All" webcomic. ^_^ I'd say that it was purely concidence which can happen quite often given how many people are coming up with OC designs. Thanks! 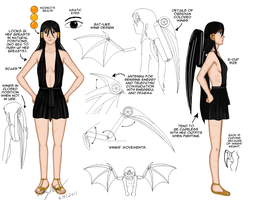 and here's the reference of my OC, Akosmia (note June 2011 date) for sake of having fun comparing our OCs. Yep. Your character seems evil, right? 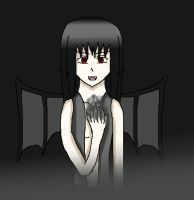 My AKosmia is not evil, just a poorly understood perverted human with cyborg wings and bad temper. She's very protective of her little sister, Energeia. Secrets are the hardest to keep. Gunslinger: *he laughs evilly whilst standing in front of a bunch of kooky-looking aircraft* BEHOLD! THE DARKWING STEALTH AIRCRAFT DIVISIONS! *he switches to a sotto voice* Don't tell my archenemy Russell a word about Darkwing, and i'll pay you big time, Akosmia. Mike: General... You're broke, and I only have $2 in my wallet! Gunslinger: SILENCE! you can draw coins and dollar bills, can't you? Gunslinger: Like I said, Akosmia... Not a word to Russell about Darkwing, and I'll pay you big time. So much for keeping secrets from people there. Heather: And to think we're doing what we can in protecting RedFalcon23's Shiori's secret there. Akosmia: "Duh, that's why we used to stay away from any civilizations. I know from my experience with those #$@# witchhunters!"